I keep a pretty close watch on new cookbooks that are published, but once in a while something slips by me. The hard cover version of The Modern Vegetarian by Maria Elia came out in 2009, and I didn’t realize what I was missing until the new paperback just appeared late last year. I received a review copy, and started making up for lost time. The book is full of pretty dishes with great flavors that are fun to serve. The Dukkah-Rolled Soft-Boiled Eggs with Chickpea puree served on crostini would be a showstopper at a party. The Chile and Rosemary Eggplant Parcels are stuffed with buffalo mozzarella and nestled into a mash that mixes more eggplant with potatoes. Elia makes suggestions throughout the book for substituting various vegetables and herbs depending on the season. I couldn’t wait to try the Capri Lemon Pasta with mascarpone and parmesan cream sauce, but rather than using peas, fava beans, and asparagus, I made it with spinach. It was delightful. There’s also a chapter full of sweets with stunning things to make like Stuffed Fig Pastries with Honey and Nuts and Cafe Latte Ice Cream with shards of Coffee Tuilles. Before I get too distracted by the desserts, I need to tell you about these Carrot Pancakes. 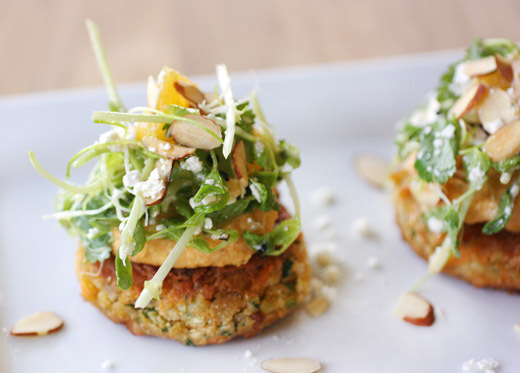 The spicy, little cakes are made with chickpea flour and grated carrots and are topped with a carrot hummus and a fresh tangle of sprouts with sliced almonds, orange chunks, and feta. This is the kind of dish that can easily be done in stages. The carrot hummus can be made a day or two in advance, and the pancakes can be mixed and formed and refrigerated until you’re ready to cook them. The feta salad is optional if you’d rather just serve the pancakes with the humus, or you could even sprinkle the hummus with crumbled feta by itself rather than make the salad. I started by making the hummus. I chopped some carrots into small pieces and boiled them until tender. 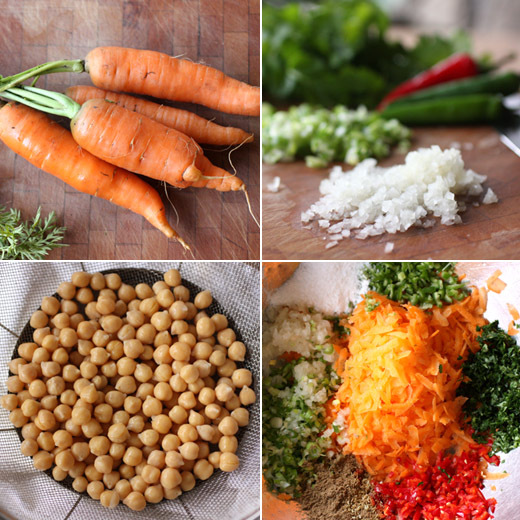 The carrot pieces were drained and added to the blender with olive oil, rinsed and drained canned chickpeas, some chopped garlic, lemon juice, tahini, ground cumin, and salt and pepper. The mixture was blended until smooth, and I added just a bit of water for a softer consistency. With the hummus done, I moved on to the pancakes. Grated carrots were mixed with finely chopped onion, green chile, and I used one red chile as well, crushed cumin and fennel seeds, ground coriander, chopped cilantro, baking powder, chickpea flour, semolina, salt, and some water. Olive oil was heated in a skillet, and the thick batter was spooned into it in little cakes which cooked for a few minutes on each side. The recipe is written for making four to six cakes, but I made smaller cakes. For the salad, a dressing was whisked together with sherry vinegar, water, extra virgin olive oil, Dijon, and minced garlic. A mix of watercress, shiso, and sprouts is suggested, but I used pea shoots, onion sprouts, and cilantro leaves. Those were tossed together with chopped, segmented orange slices, sliced almonds, and crumbled feta. The dressing was added, and the salad crowned the dollop of hummus on each carrot pancake. There was a lot to like about this from the crispy, little pancakes to the pretty color of the hummus with carrots and the mix of added flavor from the salad on top. I would have enjoyed each of the three parts separately, but all together, they made a special dish. With so many interesting flavor combinations and ways to adapt the recipes for what’s in season, I’ll be reaching for this book often. Recipe reprinted with publisher's permission from The Modern Vegetarian . This recipe is perfect as a light lunch, snack or starter. It also makes great party canapés, as it can be prepared in advance. The salad is entirely optional. Preheat the oven to 200°C/400°F/Gas Mark 6. To make the pancakes, mix all the ingredients, except the olive oil, together to form a thick batter. Heat the oil in a small non-stick frying pan until hot, then spoon in about a quarter of the batter and fry until golden on both sides. Repeat with the remaining mixture to make 4–6 pancakes in total. Leave to drain on a wire rack, and then keep warm in the oven. Cut the carrots into thin slices, drizzle with olive oil and season with salt and pepper. Place in a roasting tin, add 200ml water and roast for 20–30 minutes until softened. While still hot, put them in a blender with the remaining ingredients and whizz to a smooth puree, adding a little water if too thick. Season again if necessary and refrigerate until needed. If you prefer, you can boil the carrots instead; just cook until tender and follow the recipe as above. To make the salad, mix all of the salad ingredients and toss together well. Whisk the dressing ingredients together and season to taste. To assemble the dish, reheat the pancakes in a warm oven, place on individual plates and top with the carrot hummus. Dress the salad with the sherry dressing and place on top of the hummus. Love all of the flavours in these little cakes Lisa. Wow, these carrot Pancakes look so inviting and stylish! I have seen this cookbook n heard is really goodone.. will get it soon. Thanks for sharing this recipe. I really truly love that book. I feel like the recipes are so different from many of the other books out there. I have made that recipe and loved it. Yours look a lot prettier! A wholesome and scrumptious dish! Really mouthwatering. I have heard of this cookbook it does sound good! Love your gorgeous recipe choice! I am always scouting for vegetarian dinner options and this "new to me" cookbook sounds full of marvelous flavors! In 2009 I was still buried in 50 hour workweeks! However, now is a great time to explore new recipes and cookbooks. Thank you for the introduction! They're so cute and little! Gorgeous photos, Lisa. Love that there are suggestions for substitutions 'cause I sure like to substitute. Those little morsels of deliciousness are tempting, Lisa! They're so colorful, just beautiful! I've had that book on my wish list forever and I did not know about the new version - tks! I love the beautiful colors and these sound delicious. We're going to start Ruby on solids soon and I reaaly like the sound of that carrot hummus. I'd have to make a bland version for her w/out the garlic and spices but it still sounds delightful and nutritious. I made these two days ago from her book. Sooo yummy! I'm going to make the patties in bulk because they were so tasty. I did reduce the salt though, I thought it was a bit overkill (and I'm glad I did as it was pretty salty). Oh Lisa, these are such a cute treat...love how you layer them...looks delicious with all the various texture. That cookbook sounds fantastic! Thanks for bringing it to my attention. I'll be sure to check it out. carrot hummus? well, i never! 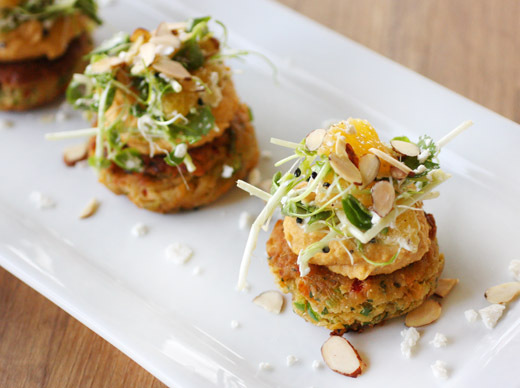 what a tasty idea, and your final plating is elegant and appetizing! I've had this book on my amazon wish list for a while and now I know I absolutely NEED it! What a gorgeous meal! It sounds so delicious! And the plating makes it even more enticing. What an incredible looking presentation. This recipe looks like a little bit of work, but as you say, you can make it in stages. It looks totally worth the effort. These look gorgeous and sound delicious! I will definitely be looking up that cookbook. Thank you!